Temperature and strain measurement with the FBG-Technology is intrinsic. 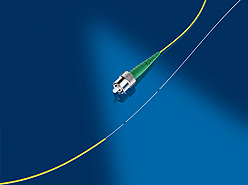 One single mode fibre with a diameter of 150µm has on a length of 12mm a sensor applied that allows performing the measurement. The fibre from there to the next sensor or the interrogation unit is without any more influence and works only as a data transfer fibre like in the telecommunication. Most applications require additionally an extra sensor element to protect the fibre or to allow the strain sensor to be pre tensioned before being applied in order to measure also negative strain. Applying this sensor inside composite material, it is mostly the bare fibre that goes in there. Sensor elements would be too big. The challenge is to design the output on the fibre in order to protect it.